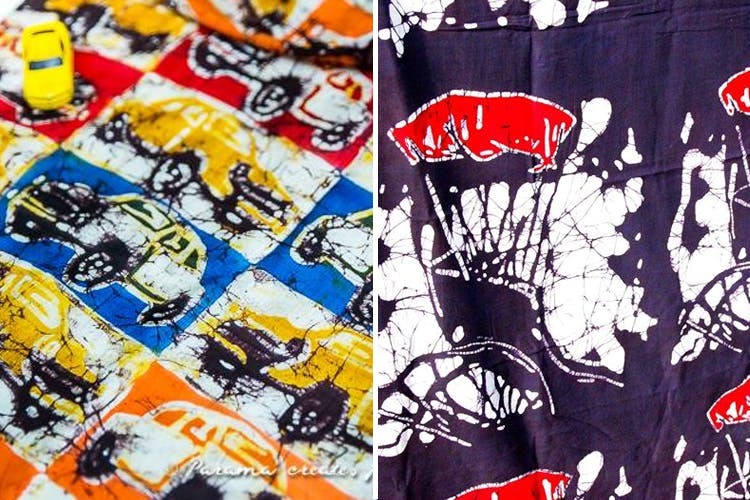 If you fancy some cool, local art on your clothes, indie brand Parama will charm the pants off you. City-based designer Parama Ghosh makes amazing blouses with whimsical appliqué and embroidered designs inspired by the world of art, cinema and literature. Her brightly-hued blouses have fun motifs like Kolkata’s yellow cabs, rickshaws, raindrops, local flowers like hibiscus, and the Kolkata skyline. Particularly noteworthy is the Telengana woman blouse and the Frieda Kahlo blouse. Apparently, it's the things she is inspired by -- be it Howrah bridge to cinema or the rains to food, it finds its way onto her creations. Sometimes a sari or dupatta will showcase something from a good book she has read, or a movie she has watched, incidents she has experienced, and even some forgotten Kolkata songs. Her Calcutta Skyline blouse caught our eye. It is the silhouette of her favourite city reflecting the Howrah Bridge, Victoria Memorial, St Paul’s Cathedral, Kalighat temple and more. We love that she uses atypical Bengali weaves like dhonekhali.